Director Rebecca Miller on Set. Photo by John Pack, Hall Monitor, Inc., Courtesy of Sony Pictures Classics. 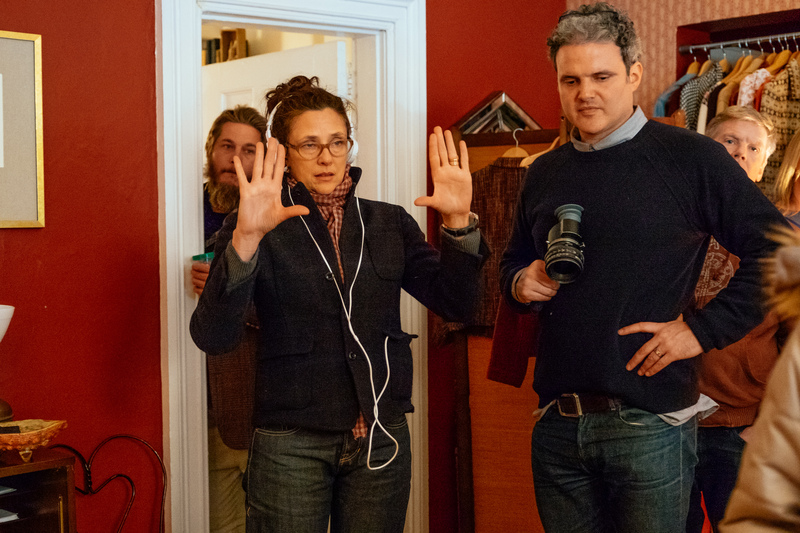 Maggie`s Plan directed by Rebecca Miller has an interesting concept that will make you think and think why Maggie actually plots that kind of plan. But if you give a chance and travel with Miller into Maggie’s mind, you might not agree with her 100%, but once you see people who become, if I can put it this way, ‘victims of her idea’, then you will certainly appreciate not only Maggie`s existence, but moreover, be grateful for whatever she has done. This is why it was important to hear what Rebecca Miller had to say about her truly brilliant film that I am sure, you will find it quite amazing the same way I did. MOVIEMOVESME: What inspired you to make this film? Rebecca Miller: I just love the emotional geometry. There was something so both absurd and strangely possible about the story. I also liked the fact that there was so much room for me to write. On the one hand I had this very rich kind of a triangle and on the other hand I had a lot of room to put my own stamp on it. So it was a perfect combination of things. MOVIEMOVESME: Lot of people talk about Woody Allen when they talk about this film. Rebecca Miller: I grew up with Woody Allen movies and I’m sure you can’t not have Woody’s shadow over a film that takes place in New York among the people more comedic in nature. I guess what I was looking at the most was 40s movies, so not so much Woody in this. But yes, you know! MOVIEMOVESME: Can you talk about your casting process? Rebecca Miller: I’ve been working for the same casting director for twenty something years. She and I have very strong bond and a very effective shorthand. I had already worked with Julianne and wwe were close friends and she seemed perfect for this part. Once I met Greta I realized she was perfect. Maya was somebody I knew and I loved her film work too. Basically she and I worked together very very closely and intensely. MOVIEMOVESME: How would you describe Maggi’s appearance and impact on John and Georgetta’s life? Rebecca Miller: Maggi is kind of a facilitator in life; it’s a jo that she does. She considers herself a bridge. There’s actually two moments in this film where she’s a bridge that she’s walking on with John that’s important. In a way she’s somebody who really wants to make everyone their best self and sometimes she does things that seems outrageous or destructive. But finally it resolves in the end and that’s where her goodness lies as also her uniqueness and charm. MOVIEMOVESME: You’ve never been the sort of filmmaker who worries about your movie opening in 3000 screens or whatever but concentrated more on the organic process to find the audience. Rebecca Miller: I insist that if I could I would magically put them on 4000 screens honestly because the reason I started making films is that I wanted to reach more people; I wanted a more popular art form. But at the same time I’m not willing to compromise what I like. It’s not that I try not to have commercial success. MOVIEMOVESME: Can you talk more about the casting of Julianne Moore as Georgette? Rebecca Miller: In the book she’s French and I felt that she couldn’t be French. So we came up with Danish and stuck with that. I wrote a lot of her dialogs and Julianne added that slight speech impediment. MOVIEMOVESME: How did you get on board Racheal Horovitz as producer? What was her impact or input in the movie? Rebecca Miller: We’ve known each other for over twenty years. She came on early in the process when I was writing the script. I don’t know if she had much of an impact on the actors but she is friends with Ethan Hawke so she was able to get him. It was also her idea to get Hanna for a wonderful cameo. MOVIEMOVESME: Tell us about your relationship with the costume designer. Rebecca Miller: I needed to hire a new costume designer as the ones I’d previously used were unavailable. Then I met her and found her so creative. She didn’t come with clothes but images and designs for each character. She showed me the essence of what she was gonna do for Georgette. She made these wonderful drawings for all the character’s outfit. It was a close collaboration and she was enormously brave too. She was a fantastic collaborator. MOVIEMOVESME: What is it about Maggie as a character that makes you want to tell her story? Rebecca Miller: I think it has a lot to do with our moment in time. Talking about experiences and how many different ways we have of creating families. We don’t necessarily need a classic family structure but we decide to. Everything is more difficult in a way the more freedom you have. It’s exciting but with it comes more responsibility and that’s what she realizes. You see how deeply she’s thinking about these questions. I wanted to make it a New York comedy eventually. Whenever I have a film, some of my folks add very dark elements and comedy into that. Sometimes when I’m listening to an audience and it’s a wonderful shock of present to me when they laugh. So part of my motivation I think was just to change the ratio; cos it’s not that I had no humor. MOVIEMOVESME: What do you want the viewer to take from the film? Rebecca Miller: It’s not my business but I think the movie had to be a particular way; taken out of the oven at the right moment. At the best people have told me that they get a sense of risking up a little bit from the movie. I like that idea because I think it’s quite a forgiving film about serious things but about forgiving everybody’s labels. MOVIEMOVESME: Why did you choose that Bruce Springsteen song? Rebecca Miller: I wanted the Springsteen song because in the book there’s a reference to Maggi not getting Springsteen in the way that he does while Georgette knows the entire lyrics. That was one way to show how Georgette and John have a shared past. Also I happen to know Bruce Springsteen; so I talked to him and his wife about it. They were very kind and let me use it. The idea is that John grew up in Atlantic city and there’s a whole thing about New Jersey and why Bruce Springsteen is so important to him. WOaow… fantastic reading ur blog. It will be appreciating if you read my blog and suggest me anything.